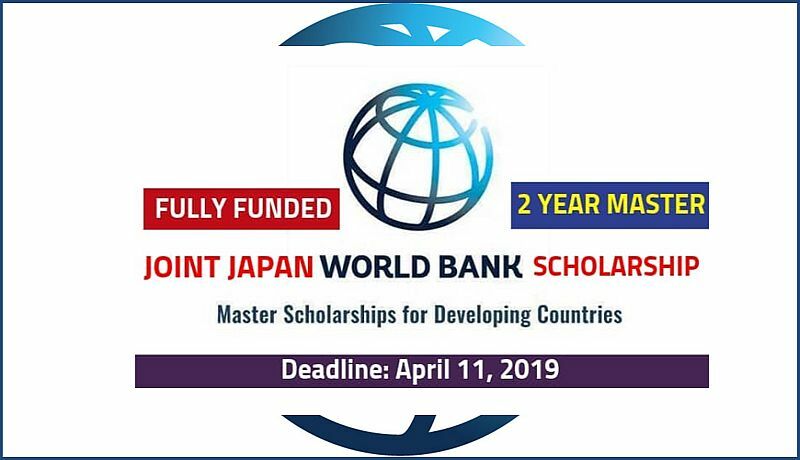 Applications are invited for Joint Japan/World Bank Graduate Scholarships Program (JJ/WBGSP) from Japan and developing countries students. To apply for the program, applicants must hold a Bachelor degree and must be a national of a World Bank member country eligible to borrow from the World Bank. The Joint Japan / World Bank Graduate Scholarship Program (JJ/WBGSP) has helped create an international community of development professionals through the Program’s financing of graduate and post-graduate studies. Through investment in education and developing human resources in the developing world, bank groups promote economic growth and shared prosperity. Nationality: Developing Country Nationals and for Japan Nationals. Eligible Course or Subjects: Scholarships are awarded for studying only at a master program that has been granted “preferred” status by the JJ/WBG Scholarship Program. 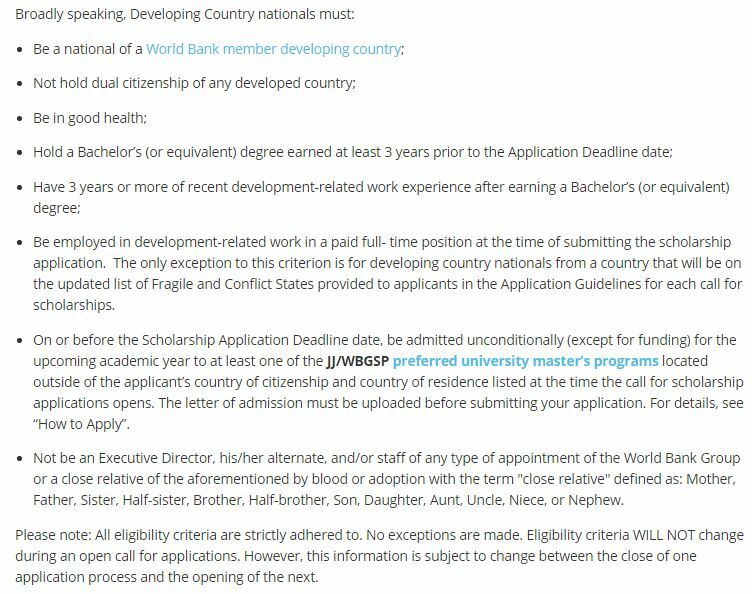 Eligibility Criteria: To apply for the program, applicants must be a national of a World Bank member country eligible to borrow from the World Bank. How to apply: Applicants can apply for scholarships to both Preferred and Partner Programs. Once you are familiar with the application requirements and processes, click here to apply, and refer to the “Accessing your online application” and “Navigating your online application” to navigate step-by-step the online application. Those seeking a JJ/WBGSP Partner Program scholarship (.xlsx 15 KB) must first apply for admission to one or more of the Partner Masters Degree Program(s). Inquiries on how to submit an admissions application to a partner program should be submitted to the respective university. Supporting Documents: To apply you need to submit the following documents: Two recommendation letters, One completed Application Form (which includes an applicant’s agreement to conditions stated on the Signature Page of the Application Form). Applicant’s Bachelor’s degree diploma, C.V. has written in English, unconditional (except for financing) Letter of Admission for the upcoming academic year to the JJ/WBGSP preferred university master’s program. Admission Requirements: Before applying for the scholarship applicants need to take admission in JJ/WBGSP preferred university master’s programs for the upcoming academic year. Deadline: The deadline for all materials to be submitted is April 11, 2019.